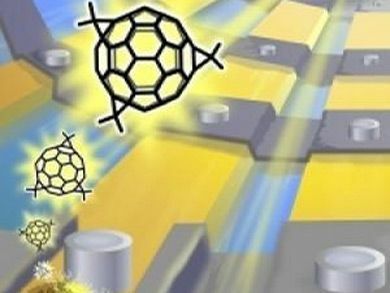 Israeli researchers developed a transistor based on a single carbon-60 molecule. This technology could potentially lead to mobile devices with faster and larger memories and much lower power requirements. Even more importantly the new technology is said to be ready for production in existing memory productions faculties. Mobile devices such as smartphones and tables are becoming increasingly popular in recent years surpassing more traditional desktop and laptop computers. However despite the ongoing improvement in their capabilities they still tend to have reduced memory capacities and always seem to run out of battery just when we need them the most. To tackle these issues (as well as others) Ph.D student Elad Mentovich alongside his supervisor Dr. Shachar Richter from the Department of Chemistry and Center for Nanoscience and Nanotechnology in the Tel Aviv University in Israel, worked to develop a new type of molecular transistor based on a Carbon molecule. The new transistor is based on a single carbon-60 molecule that could be the basis for both a logic transistor and a memory element. The entire molecular transistor can be as small as 5nm (several times smaller than existing memory technology) although according to its developers it will not require new fabrication facilities to produce it (several manufacturers have already showed interest in the technology). Q: Can you explain in a few words how the molecular transistor was developed? A: The Transistor was developed during the PhD thesis of my student Elad Mentovich which aimed to investigate the electrical properties of monolayer of molecules. During the research we concluded that this transistor is essential tool for understanding the electrical properties of molecules and other nanoscales devices. Q: How did the idea for the research came to you? A: Molecular transistors have been suggested theoretically since the beginning of the field of molecular electronics. We decided to to adopt a vertical approach which is different than other approaches used in this area. Q: C60 (aka Buckyball) was first created in the lab around 1985, is this the first C60 transistor and if so what made it so difficult to manufacture until now? A: It not the first C60 transistor. The first was demonstrated about 10 years ago. However our transistor is different. It is the first which is manufactured in mass production and with high reliability. Q: What are the applications of the new transistor (are we only talking RAM replacement or can it also be used as a CPU or alternatively as permanent storage, like a ultra fast Flash memory for example)? A: We have shown and patented both logic gate and memory applications. Q: It was mentioned that the molecular transistor could be faster than existing memory technologies – how much faster are we talking here? A: Theoretically, it should be at least one or two order of magnitudes faster – we are now checking it experimentally. Q: What is the current status of the research and what do you require to bring a product to the market? A: The first prototypes of memory devices are now being checked by leading companies. Q: Do you have an approximate time frame for the first device which will use the molecular transistor? (if all goes well of course).